We live in a society that is at once the most politically aware and the most consumer oriented in human history. 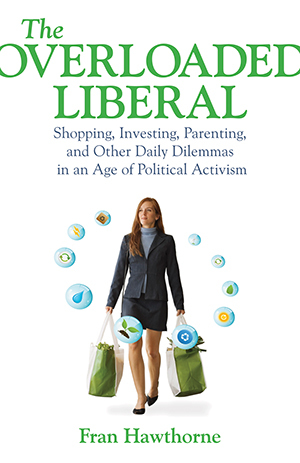 Twenty-first-century shoppers don’t just consume; we investigate and categorize the impact of our decisions on climate change, animals, our health, our political views, geopolitical relationships, working conditions, and more. Yet when we actually try to live according to our principles, it can be so overwhelming, contradictory, and demanding that we want to scream. Every step, every dollar, every swipe of a paper towel has become a decision that can make the world a better or worse place. Take one daily dilemma: what jacket should I buy? If it was made in El Salvador, China, or Vietnam, was it sewn by workers in a sweatshop at near-starvation wages, forced to labor twenty-hour days in dangerous conditions? Are those jobs actually considered desirable in those countries? Can I even find a jacket made in the United States? If I do, should I insist on union-made? But what if that’s more expensive? And what fabric is it made of? Does it contain animal skins? Is the cotton organic? What kind of dyes were used? Does it have fair-trade certification? Oh, and by the way: does it look good on me?